Alternatively use any "Transperth" bus from St Georges Tce travelling East and get off at the last Adelaide Terrace stop before the Causeway Bridge. We are situated 100 metres from that bus stop, on the banks of the Swan River. Please note we are a separate building to the Ku De Ta and are located at the back of the car park. Look for distinctive Family Quad Cycles parked at the front of the building. You can also use the "Red" Cat bus and get off at the Hyatt Hotel. 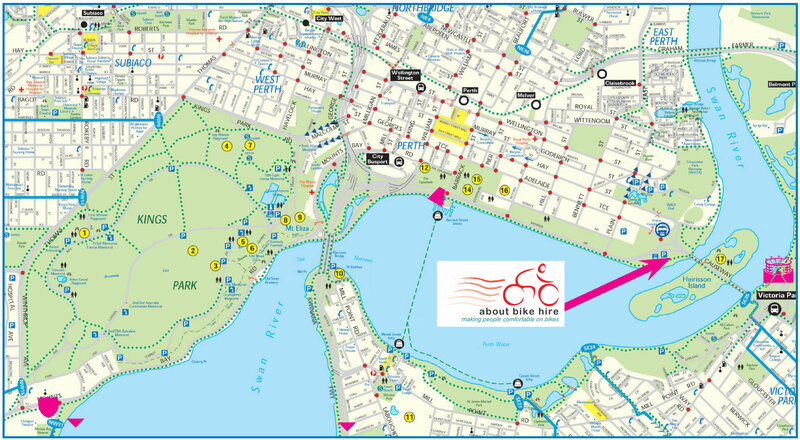 Walk South to the Swan River and then 400 metres East to the Point Fraser Reserve. BY CAR: We are located in a City of Perth car park called Point Fraser and there is usually paid parking available. The car park can be accessed via the Causway and turning left off Riverside Drive or alternatively you can also turn right off Riverside Drive with a turn in lane just east of Plain Street. PLEASE NOTE we are in a separate building to the KU DE TA, look for the brown bike and kayak sign and cross the metal bridge to the overflow section to the car park. After crossing the bridge you need to turn right and our building will become visible. Click to open a new window with a larger map with a wider view (608 Kb).